Jessa and Mark Anderson, of Different Seasons Jewelry, photographed these vibrant fire agates from Aguas Calientes Mexico. It’s fascinating that regardless of the stone’s shape, it maintains a circular pattern within it. Fire Agate is described as a variety of agate containing inclusions of goethite or limonite, producing an iridescent effect or “fire”. The color layers are often described like breath on a pane of glass. The thin layers in this material diffract light back to the eye in rainbow patterns of red, green, yellow and blue. The beautiful colors in fire agate may appear as tiny pinpoints, bubbles, bull’s eyes, flashes, specks, swirls or even as a combination of patterns making for endless possibilities. The world’s fire agate deposits stretch from southwest United States to northern Mexico. 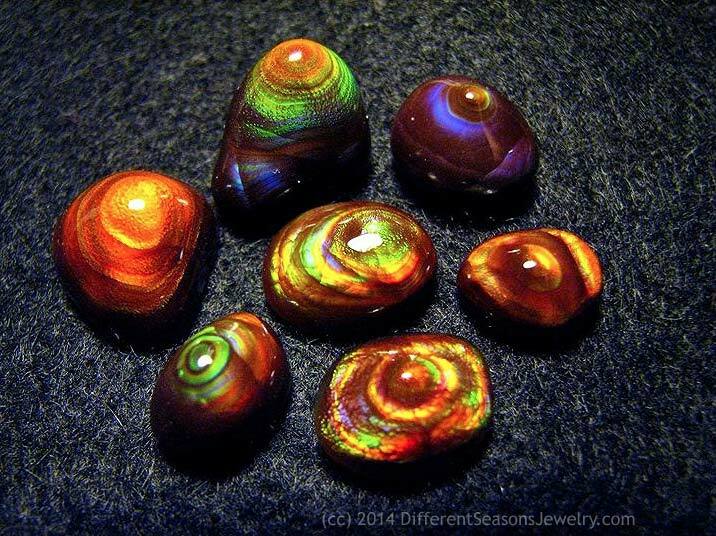 View more of their fire agates via their Agate Album on Flickr.